Two Star Wars novels released on Force Friday II. Star Wars: Phasma a part of the “Journey to Star Wars: The Last Jedi” by Delilah S. Dawson was released today. This novel, published by Del Rey, delves into Phasma mysterious past. The official description is listed below. 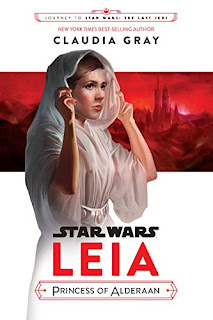 The other novel that was released today is Star Wars: Leia, Princess of Alderaan by Claudia Gray. This novel, published by Disney Lucasfilm Press, is also a part of the “Journey to Star Wars: The Last Jedi." This novel features the never-before-told story of how young Leia Organa comes to join the rebellion against the evil Empire. Would you to listen to both of these new Star Wars audio books, for free? If you're new to Audible, you can sign-up for a free trial of Audible, at http://audible.randomcitypodcast.com, to get TWO FREE audio books! The two free audio books are yours to keep, even if you cancel your membership during or after your free trail of the service.